We should see if we can get that guy to join EF. I reckon he'd have a story or two to tell. For most people the idea of selling cheese to the Swiss is seen as the equivalent of selling ice to an Eskimo, but not for Michael Jones, the British entrepreneur who has been successfully running a business selling Artisan British cheese in Switzerland since 2007. When Brit Michael Jones moved from London to Zürich, he saw the switch as the perfect opportunity to pursue his dream of working in the food industry. After careful analysis of the Swiss retail market, Jones, the former marketing and graphics professional, and his now ex-wife, Astrid, decided to open up an online cheese shop that exclusively sells British cheese. “The Swiss love cheese and chocolate and I don’t really like sweet things, so I thought I could sell cheese. The first thing I noticed was that no one was selling British cheese in Switzerland and that was it, I found a gap in the market,” Jones told The Local. In its first year, the small business saw Jones importing 700 kilograms of cheese, what he calls “a slow start”. But in September 2010 the company saw considerable growth after opening a shopfront called The British Cheese Centre at the Markthalle Im Viadukt in Zürich, and now imports approximately 18,000 kilograms of cheese a year. “Markthalle is the best location for us. As soon as the physical store opened we quadrupled our sales overnight. People look for unusual specialties when they come to Markthalle and I can grab people and ask them to try my cheese, it’s a 'free market' in a sense,” said Jones. Although The British Cheese Centre has become a popular, successful business in Zürich, people are still surprised by its success. “When I give talks to MBA programs and business colleges about my inspirational business Idea, I tell them that I sell cheese to Swiss people and everyone thinks it’s a ridiculous idea because Switzerland has so much cheese,” Jones laughs. “But Britain is the largest producer of cheese, in terms of variety, and British cheese is so different from Swiss cheese and a lot of Swiss people want to try something different sometimes." According to Jones, his best-selling cheese is an organic cheddar, called Godminster. Although Jones’ biggest obstacle has been mastering German, he has had no problem connecting with the locals. “Even after ten years I still struggle with German. I can talk about food. I learnt Spanish as a child really well, but German is difficult for me. I always say to my Swiss customers I speak ‘Käse Deutsch’ (Cheese German) and they laugh,” he jokes. Jones says that his advice to other entrepreneurs that are new to the market is to focus on the Swiss market, rather than the expat one. “If you are a foreigner or immigrant, do not make the mistake of targeting the expat community, target the Swiss community. The Swiss community will spend more money on quality and they will be your most loyal customers. When you get a Swiss customer, who likes you and likes your products, they will sing your praise to everyone. They will be your ambassadors,” advises Jones. Despite being a successful business owner, Jones is just happy to be following his passion and believes satisfying customers is much more important than making a massive profit. Amazing how up to date TheLocal is. I guess by the time they report on it, world war 3 will be over. Simple Economics: Large Supply of local Swiss cheese in Switzerland, psychology of Swiss and foreign residents/customers eventually desire something different. --> Scare supply of "good" imported cheese = business opportunity. There are plenty of other opportunities in Switzerland as well for foreign food. In my opinion, a few more Mexican joints would be just fine with me. 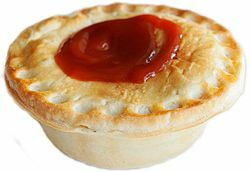 What Switzerland really needs is the good ol' Aussie meat pie. With a dollop of tomato sauce (not "ketchup"), it's the perfect lunch (or dinner, or breakfast) when you're on the go. What should i eat for snack time then ? Snack time is sausage roll time! Absolutely not the same. Sausage rolls are slightly spicy sausage meat rolled in flaky pastry, while Wurstwege are whole sausages made primarily from pigs' trotters and sawdust, wrapped in something soggy. But in any case, where's the tomato sauce? No squeezable sachets anywhere near the Wurstwege. You might refer to Wienerli im Teig and not Wurstwegge, which is made from puff pastry and seasoned sausage meat. I haven't seen people eating tomato sauce with eat, but spinach was common, at least in my family.